The so-called discursive turn in social psychology has provided a framework for understanding psychological processes as interactional phenomena. This chapter considers how doctors actually provide support, focusing particularly on how they empathise with their older patients during end-of-life or palliative care. Using conversation analysis to examine recordings of actual doctor-patient consultations taken from a hospice, this research demonstrates that empathy is an omnipresent feature of palliative care interaction. This means that doctors display it both when responding to patients’ emotional disclosures, and when recognising the concerns that patients might have regarding, for example, difficult-to-follow advice. 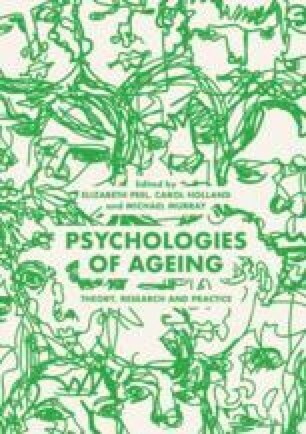 These findings build upon earlier research showing the end stages of life to be individual and varied, rather than adhering to generic, one-size-fits-all conceptions of what constitutes “good death.” They also have practical implications, as well as illustrating the benefits that an approach grounded in discourse (rather than cognition) can have for research in the psychology of ageing. I would like to thank the patients and doctors who participated in the study from which the data for this chapter were taken. I would also like to thank Ruth Parry for her helpful comments, Luke Feathers, Christina Faull, and LOROS hospice. Ruth Parry is funded by a National Institute for Health Research Career Development Fellowship CDF-2014-07-046. The data used in this research were collected by the “VERDIS” programme of research and training funded by The Health Foundation Insight Award RU33. Colons indicate that the immediately preceding sound was elongated, with more colons meaning greater elongation. Underlining indicates that the underlined sound was emphasised. Brackets indicate that the hearing is tenuous or unclear. Equals sign indicates that two pieces of talk are connected. Indicate different forms of ending intonation. A full stop indicates a fall and a comma indicates a partial rise. Square brackets indicate overlapping talk. Numbers in brackets indicate pauses, timed to the nearest tenth of a second. Indicates a micropause, smaller than 0.2 seconds. Degree symbols indicate that talk was noticeably quiet. Standalone h’s indicate inbreaths (preceded by full stop) or outbreaths (no full stop). Inward-facing carets indicate that talk was noticeably fast. Outward facing carets indicate that talk was noticeably slow. H inside brackets within a word indicates laughter. Italicised h within a word indicates breathiness. Used to draw attention to analytically relevant stretches of talk. Up and down arrows indicate sudden shifts in pitch. Used to denote a sniff, e.g. when the speaker is crying (see Hepburn and Bolden 2017).